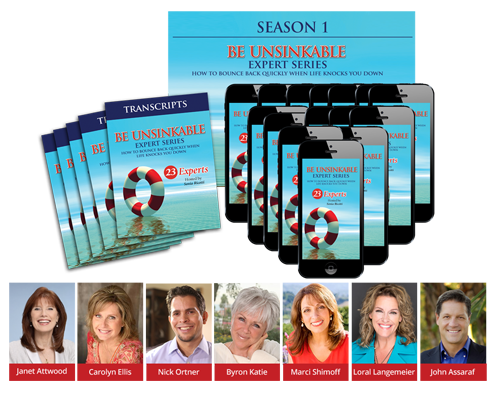 Introducing the Unsinkable Bounce Back System 2.0 program! Success Beyond Your Wildest Dreams! career, relationships, health, inner peace and happiness! …and no matter what you do or how hard you try to turn things around, nothing seems to work! You can feel frustrated and demoralized. You may be wondering why do others seem to have it all together and experience great success, but no matter how hard you try, it just doesn’t work for you? NOW…imagine being in a place where money is flowing easily, freely and from everywhere; where you can do what you want, when you want and buy whatever you please? Imagine loving what you do (your job, career or business) and you’re experiencing massive success. Imagine all your relationships are positive and uplifting. 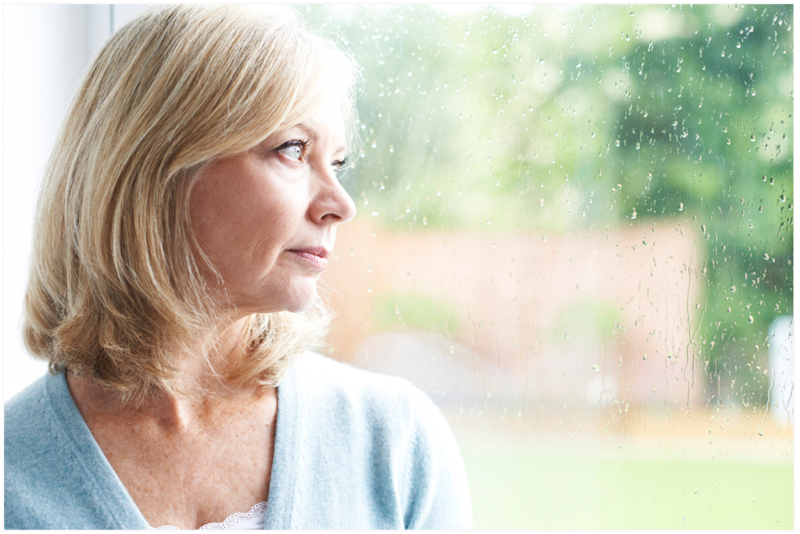 Imagine your health issues are clearing up daily and you feel energetic and healthy. Imagine if you could actually LOVE your life and be happy, healthy, abundant and free! I have since made it my mission to help people everywhere around the world turn their lives around in a big way and achieve the success and the life they absolutely love and deserve. No more guessing or “hoping” to turn things around…I will tell you exactly what to do and how to do it. 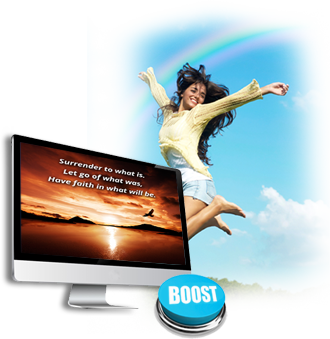 Quickly Achieve Your ULTIMATE LIFE! In this amazing program, Sonia will guide you through a series of powerful tools and techniques that can help you not only overcome any adversity you’re experiencing in your life — but also guide you to achieve all the success and happiness you desire. 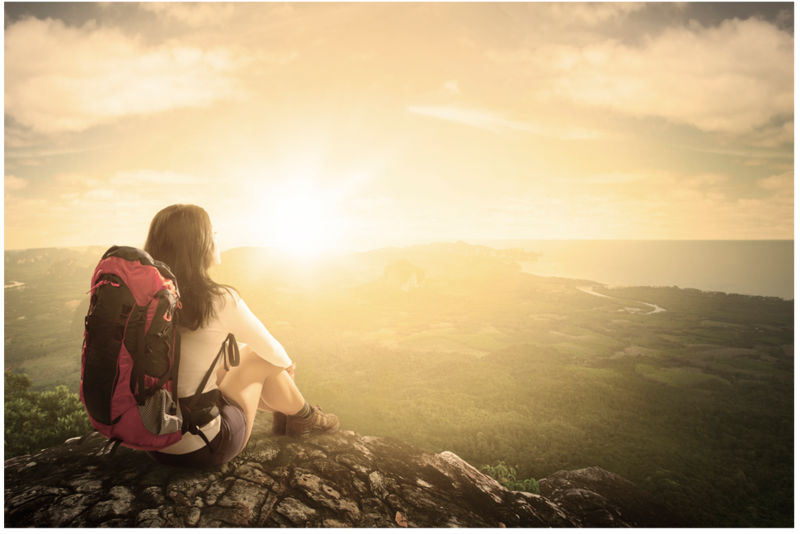 tools and opportunities to springboard yourself into the life you are meant to live. working at its optimal level to manifest great wealth, health, relationships and more! you feel; you will attract great things, people and situations into your life. head, or to affect how you feel. a safe-haven where like-minded positive people come together to help each other. What People Are Saying About Sonia Ricotti And Her Programs! 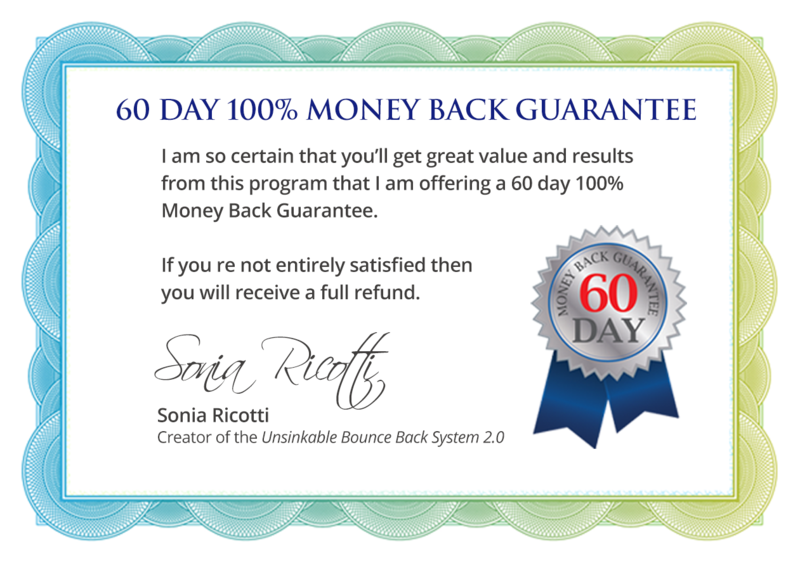 “Sonia Ricotti’s Unsinkable Bounce Back Program is one of the most effective courses I have ever had the pleasure to participate in and I have done many programs. Her easily implemented tools like the AM and PM daily meditations and the Circle of Light Facebook page helped me stay happily in the present moment and feel fully supported and no longer alone. The seven sessions helped me reprogram my Conscious and Unconscious Mind, and their resulting limiting beliefs, by examining what was not working in my life, both past and present. Before Sonia’s program I was extremely overweight, agoraphobic, (I had trouble leaving my home), on disability for P.T.S.D, (post-traumatic stress disorder), for sexual abuse, had smoked for 35 years and was completely confused about my purpose on earth. Shelly suffered a life-altering accident at work that resulted in her losing her eyesight and the use of her hands. She became crystal clear what action steps to take and what she wants to do in life. She attracted lots of new work opportunities and even manifested a $5,000 speaking gig (for the first time ever). She experienced true inner peace and gratitude and is incredibly optimistic and excited about life. Her sleep patterns have completely transformed. In the past she slept only a couple of hours a night due to her severe pain from her injuries, and now for the first time in 3 years, she is able to sleep straight through the night. 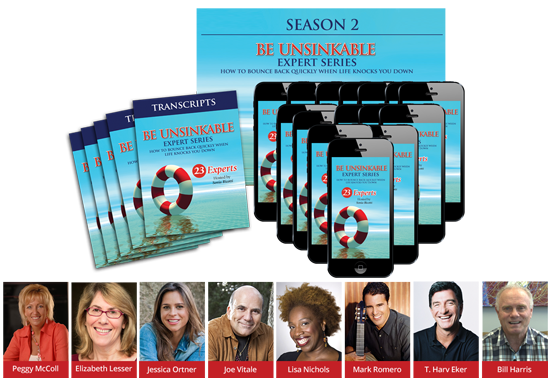 What’s Included in the Unsinkable Bounce Back System 2.0? 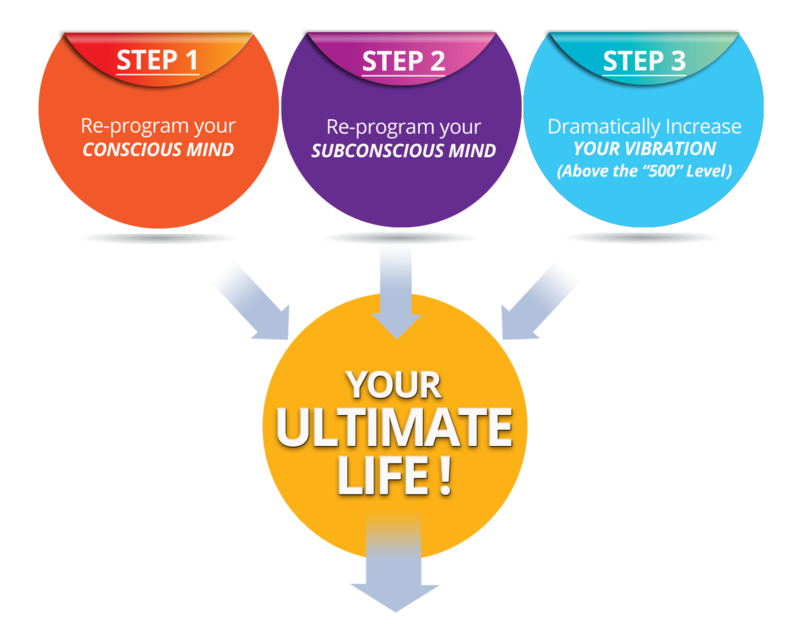 In this 7 module program, you will get the step-by-step training required to completely reprogram your conscious mind, reprogram your subconscious mind and elevate your vibrational frequency to that super high “above 500” level. With this life-changing training, you will bounce back quickly from ANY situation! You’ll experience massive transformation in your life and achieve immediate and lasting inner peace (even in the midst of the most stressful of situations). You’ll discover the true secret to easily manifest great wealth, achieve optimal health, experience harmonious relationships (even with the most difficult people) — and begin living a life beyond your wildest dreams! 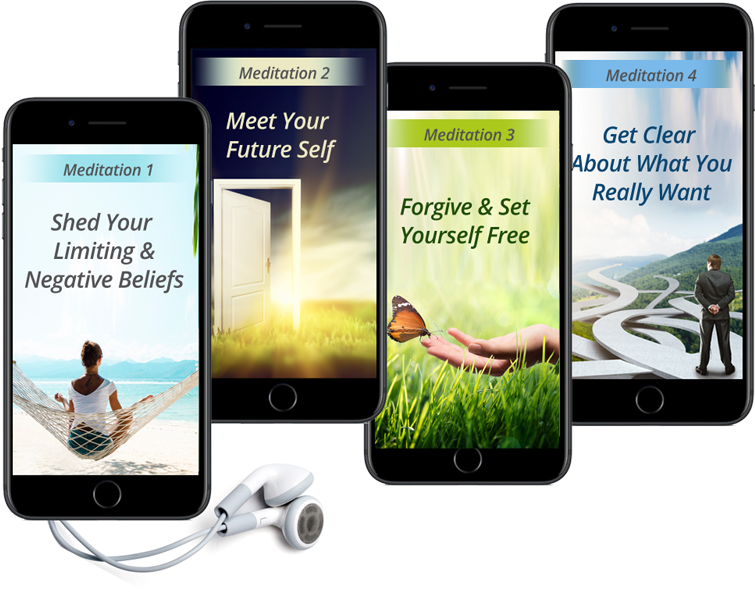 These meditations will completely shift and transform all areas of our life (wealth, health, relationships, career, business and more!). These are 12 minute AM and PM Activations infused with Centerpointe Research Institute's Holosync® audio technology that will instantly elevate your vibration state to a state of love, peace, joy and gratitude. 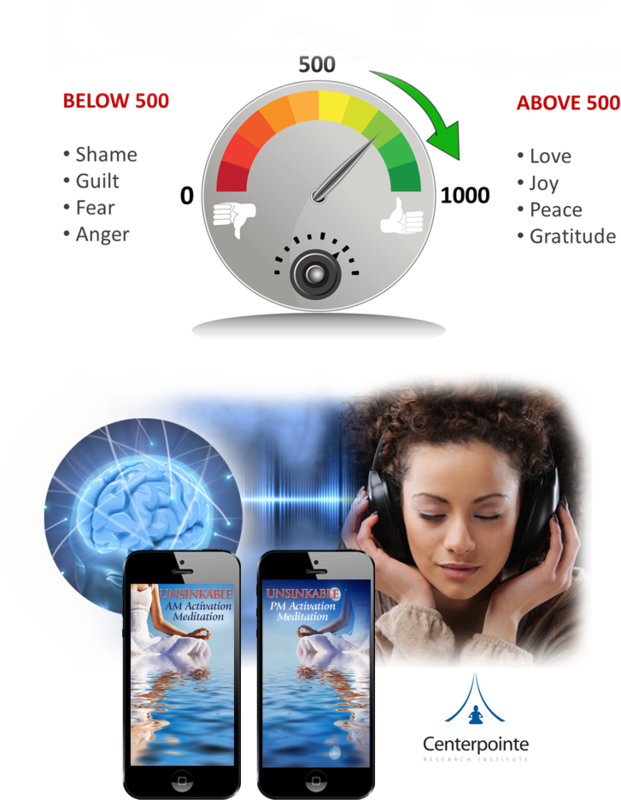 This special technology is designed to allow you to easily enter a deep meditative state to fully absorb the message deep into the subconscious mind and immediately shift your vibrational frequency to the “above 500” level. It is essential to elevate your vibrational frequency in order to manifest and attract your greatest life! These instant activations will instantly put you in the highest vibration state. High-Vibration and Mind-Reprogramming Tool: Watch These Unsinkable NEURO-Mantras. 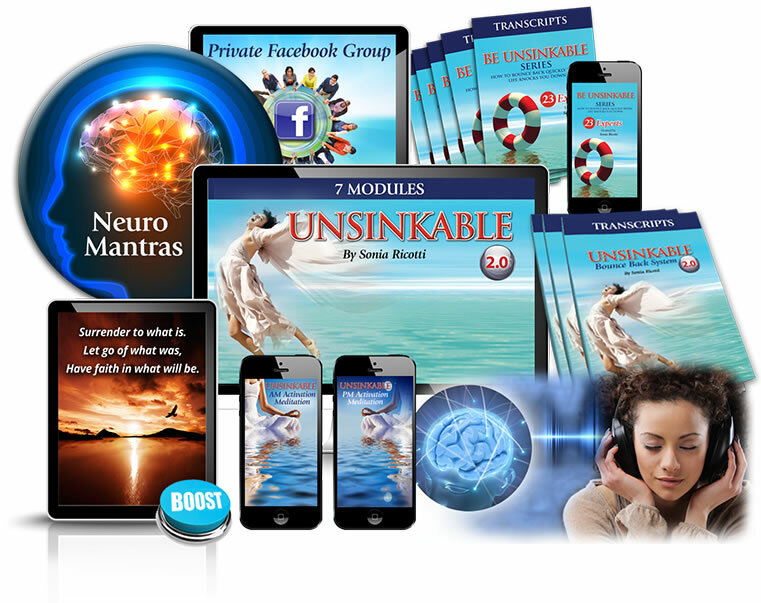 These new NEURO-Mantras have been created specifically for the Unsinkable Bounce Back System 2.0! They elevate your vibration quickly and reprogram your subconscious mind with positive beliefs. 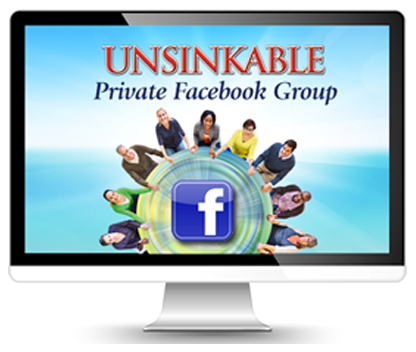 You will never forget what you’ve learned from the Unsinkable program with these two BOOSTER videos. You’ll enjoy stunning high-vibration images, music and deep powerful messages you learned from the program. 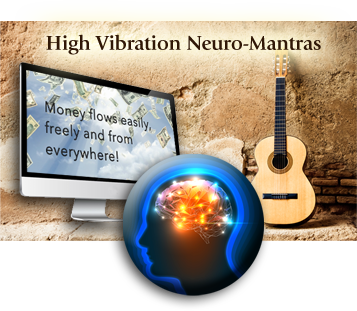 With this tool, you will elevate your vibration instantly and subconsciously reprogram your mind for great success, happiness and inner peace. Get exclusive access to Sonia Ricotti (and her team of coaches) and to a supportive, loving, positive community. This is your “Circle of Light” group. A place where you can ask questions and get support from like-minded loving people in a private and positive community. And many more great experts! As you can see from the testimonials and case studies above, the beauty of Sonia’s package is that it’s a tool for life. You can use it to transform many areas of your life through many many years to come. But you only have to invest in it once.